The thyristor is a four-layer three terminal device and the four layers are formed with the help of the semiconductors like n-type and p-type materials. Thus, there is a formation of p-n junction device and it is a bistable device. The three terminals are cathode (K), an anode (A), gate (G). The controlled terminal of this device is by the gate (G) because the current flow through this device is controlled by the electrical signals applied to the gate terminal. The power terminals of this device are anode and cathode which can handle the high voltage and conduct the major current through the thyristor. The symbol of the thyristor is shown below. 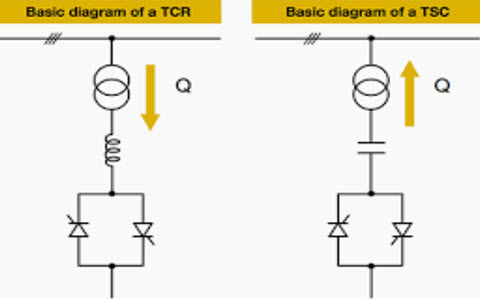 What is a TCR & TSC ? The TCR stands for Thyristor controlled reactor. In the electric power transmission system, the TCR is a resistance which is connected in series through the bidirectional thyristor valve. The thyristor valve is a phase controlled valve and it gives the delivered reactive power should be adjusted to meet the varying system condition. The following circuit diagram shows the TCR circuit. 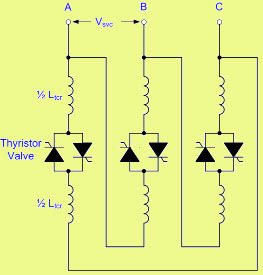 When the current flows through the reactor is controlled by the firing angle of the thyristor. During every half cycle, the thyristor produces the triggering pluse through the controlled circuit. The TSC stands for Thyristor switch capacitor. It is an equipment used for the compensating the reactive power in the electrical power system. 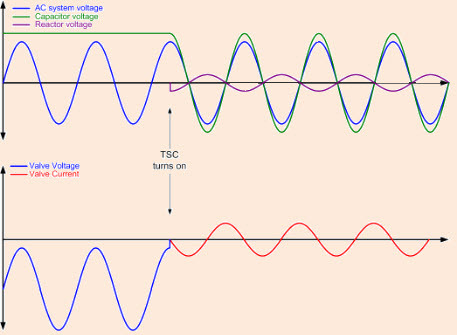 The TSC consist of a capacitor which is in series connected to the bidirectional thyristor valve, and also it has the reactor or an inductor. The following circuit diagram shows the TSC circuit. 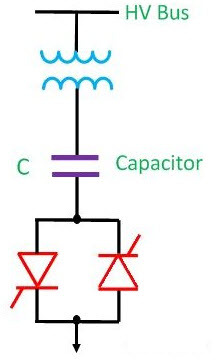 When the current flows through the capacitor can unstable by the controlling the firing angles of back to back thyristor connected in series with the capacitor. 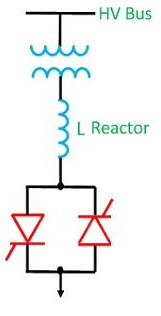 The following circuit diagram shows the Thyristor controlled reactor (TCR). The TCR is a three-phase assembly and generally connected in a delta arrangement to give the partial cancellation of harmonics. The TCR reactor is divided into two halves, with the thyristor valves are connected between the two halves. Hence it will protect the vulnerable thyristor valve from the high voltage electrical short circuit which is made through the air and exposed conductors. When the current flow through the thyristor controlled resistance it will differ from the maximum to zero by varying the firing delay angle, α. The α is denoted as a delay angle point at which the voltage will become positive and the thyristor will become on & there will be current flow. When α is at 900 then the current is at maximum level and the TCR is known as the full condition & the RMS value is calculated by the equation below. The TSC is also a three-phase assembly which is connected in delta & star arrangements. When the TCR, & TSC generates there are no harmonics and it doesn’t require any filtering because some of the SVC’s are built by the TSC’s only. The TSC consist of thyristor valve, inductor, and capacitor. The inductor and capacitor are connected in series to the thyristor valve as we can see in the circuit diagram. It is said to be when the thyristor-switched capacitor is in ON state and currently leads the voltage at 900. The RMS value is calculated by using the given equation. In the off state voltage, the TSC should be off and there is no current flow in the thyristor-switched capacitor. The voltage is supported by the thyristor valve. If the TSC is switched off for a long time, then the capacitor will fully discharge and the thyristor valve will experience the AC voltage of an SVC bus bar. Though the TSC turns off it does not flow current and it is corresponding to the peak capacitor voltage and the capacitor discharges very slowly. Thus the voltage is practiced by the thyristor valve will reach a peak more than the two times the peak AC voltage concerning half cycle after blocking. 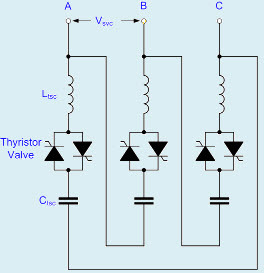 The thyristor valve required to have Thyristors in series to hold up the voltage carefully. 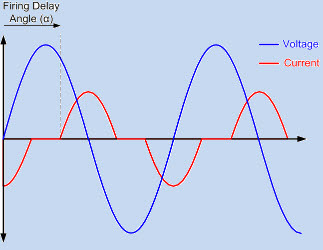 The following graph shows the thyristor-switched capacitor is in OFF condition. The de-blocking normal condition is used when the TSC is switched ON and the care must be taken to choose the correct instant in sort to keep away from creating very large oscillatory currents. 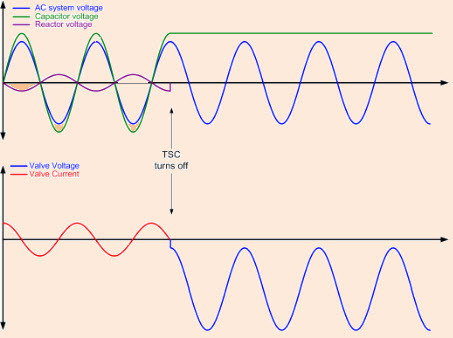 As the TSC is a resonant circuit there will be any sudden shock will produce a high-frequency ringing effect which will affect the thyristor valve. In this article, we have discussed the Explanation of TCR Thyristor Controlled Reactor and Thyristor Switched Capacitor. I hope by reading this article you have gained some basic knowledge the TCR & TSC. If you have any queries regarding this article or about the implementation of electrical engineering projects, please don’t hesitate and feel free to comment in the below section. Here is the question for you, what are the functions of the thyristor? Hello Sir. Help required make Inductive and Capacitive Proximity Sensors. Can you please help. Thanks. Hello sir ,we are doing project on tcr can you please help us in hardware design. We know you provide the solderable kit for tsr .Can you provide the same for tcr?? We have a project related to static var compensator… We are unable to make the logic for triggering of TCR. Can you please help?